Salt Lake City–based Black Flak and the Nightmare Fighters’ debut album, Once We Knew the World Well, is cinematic, harrowing and at times both frenzied and tragic. The four-piece ensemble utilizes dynamic shifts, tight drumming and a heavy use of effects pedals, creating a soundtrack to what could be a yet-unmade documentary about mankind’s conflict and grief as displayed through the chaos of World War II. 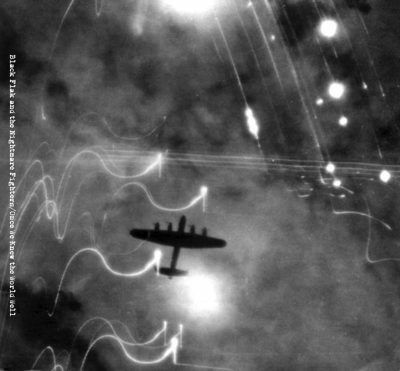 Black Flak—whose name is borrowed from a poem by Randall Jarrell, a poet whose work focused on his experiences while enrolled in the United States Air Force—open the album with the title track, which features short bursts of delayed guitar atop static-filled samples of gunfire and radio communication from World War II, gradually building up before bursting into a soaring, forlorn section that eventually descends. There is a formula for post-rock, and Black Flak have found it, immediately sounding not only inspired by but also at home among other bands like Red Sparowes. Once We Knew imparts a sense of stark nostalgia, and is as pictorial as it could be, at times capturing the feel of the war Black Flak write of without ever being grandiose or overwrought. “The Difference Between Surviving and Living,” the album’s fourth track, hails a visual turn. The band implements samples from former British Prime Minister Neville Chamberlain‘s Declaration of War, the istrumentation sounding akin to Andy Othling‘s musical scores before exploding into a frenzied guitar number accompanied by gradually building drums, eventually evening itself out again. The album’s fifth track, “From an Infinite Multitude of Individual Wills” (a reference to Leo Tolstoy), instantly springs to life, with distorted guitars providing the backdrop to a ghostlike lead, giving birth to fingerpicked guitars before being drowned out by samples of air raid sirens, once again exploding with faint reverse delayed guitars arcing in-and-out.